Everyone wants a beautiful white smile. Not only is it associated with good health, teeth that are white are also beautiful and increase anyone’s attractiveness. Tooth discoloration can occur for a variety of reasons. Understanding these can help you find the solution so you can regain your beautiful smile once more. Extrinsic staining affects the tooth’s outer layer of enamel. This is also the type of staining that most people think about when they hear the words “tooth discoloration.” In almost all cases of extrinsic staining, it is the result of your teeth coming in contact with dark-colored substances. This is because tiny particles of these substances become lodged in the tooth enamel’s outer layer. 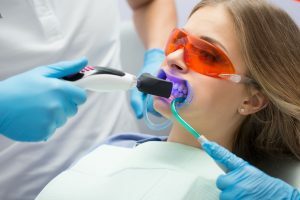 While it’s impossible to avoid all the above substances, there are steps you can take to limit the amount of extrinsic staining your teeth are exposed to. One of the best ways is to practice good oral hygiene. Make sure that you brush your teeth at least twice a day with a high-quality toothpaste and floss. Visit your dentist as recommended for regular checkups and cleanings. If you use tobacco products of any type, do your best to quit. As its name suggests, intrinsic staining refers to stains that come from within your tooth’s structure in an area called the dentin. This sensitive tissue is located just beneath the tooth’s enamel. There are numerous reasons why this type of staining — which can give teeth a yellow or gray hue — could occur. Tiny cracks and dental fractures within its enamel can provide an entry for substances to stain the interior area of the tooth. Bleeding inside your tooth, an infection in the tooth’s pulp or other dental trauma can also lead to intrinsic discoloration. The use of certain medications, such as tetracycline, a popular antibiotic, can cause tooth discoloration, especially in children. For a small portion of the population, heredity conditions can result in tooth discoloration. In many cases, the reasons for tooth discoloration cannot be determined by the patient. At All Family Dental Care, we encourage you to schedule an appointment if you are concerned about discoloration or any other dental issue.